Granada is Spain’s most visited city, drawing in tourists from all over the world. They come to see the famous world heritage site, the Alhambra Palace, or enjoy one of the many international music and dance festivals, which attract the world’s top performers. Located in the charismatic region of Andalusia, Spain's second largest and most southern region, you are guaranteed lovely hot weather during the summer months. However, as it is also set at the foot of the Sierra Nevada Mountains there is skiing during the winter, making it is a popular destination all year round. 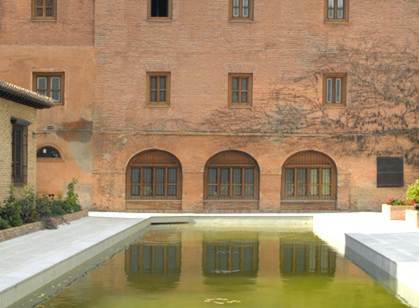 Centuries ago, Granada was once a city filled with hundreds of public baths. One of the few that remains intact is the El Banuelo which dates back to the 11th century. It is a series of chambers and curved arches, which provided baths of different temperatures. Overhead are the most amazing star shaped skylights that allow natural light in, almost giving it the effect of modern day spotlights. They also had a second purpose, which was providing an escape route for the steam. In the centre of the city is the Cathedral of Santa Maria de la Encarnacion which contains the Royal Chapel, resting place of King Ferdinand and Queen Isabella. 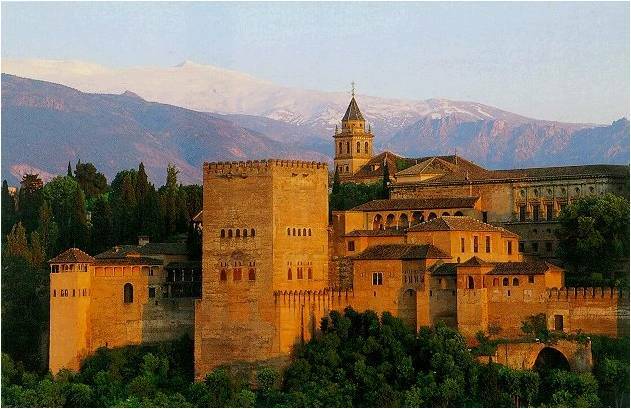 However, Granada’s most famous and most popular attraction is the Alhambra, a series of palaces built in 1238. The name Alhambra means red or crimson castle because of the colour of the stone, which is particularly spectacular at sunset. Every inch of the Alhambra is decorated with intricate carvings and ceramics. As you walk through its narrow streets and beautiful gardens, you will be able to experience the charm of this particular region as you dine in one of the many authentic taverns serving traditional dishes, while listening to the romantic sound of local gypsies singing Flamenco. During festivals you will hear the bell of the Torre de la Vela ringing, the tallest tower of the Alcazaba, and the oldest part of the Alhambra. You may be curious to know the bells are actually rung by young girls - a tradition that first started because it was believed to protect them from ending up a spinster. 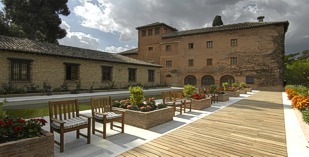 Also within the Alhambra is the Parador Granada, Hotel San Francisco, which is one of Spain’s most popular Paradors. Originally part of a palace and mosque it was built in the 1300’s and later converted into a Franciscan convent. The convent’s former chapel was where the Kings of Spain were buried, until their remains were eventually moved to the Royal Chapel within the Cathedral. Its classic interior, tranquil courtyard and lovely views of the famous buildings within the Alhambra are just some of the reasons why so many guests enjoy their stay. But it is also the sense of calm and tranquillity - no small feat when you consider the volume of visitors that come to see the Alhambra each year. Located on the hill not far from the Alhambra is the old Moorish quarter of the city, El Albaicin. This used to be an Arab Silk Market, but today the small streets are filled with shops selling local handicrafts. The houses are built behind high walls, and occasionally a half open door will give you a glimpse inside of the mosaic floors and splendid gardens. This type of house is known locally as a Carmen, and some have gardens open to the public. From the Albaicin there is a steep walk up to the Church of San Nicolas, but it is well worth the effort. With the magnificent mountains in the background, you will be able to get a marvellous view of all the sights you have just taken in. Granada has its own airport with flights from London and Stansted so flying out for a long weekend could not be easier. Why not discover for yourself why everyone around the world loves coming to this enchanting city.